ONTRAPORT's Order Forms include the ability to add taxes to the purchase. Through the use of Rules, the tax can be applied based on the content in any of the order form's billing or shipping fields, making it easy to collect taxes on a national, state or even city level. Click Sales > Settings and select the Tax Types link. Click the New Tax button. Name the tax rate, and enter the rate in decimal number format. Add as many tax entries as needed for your business. On the ONTRAforms Order Form, select the Product Grid item. In the Taxes section, click + Add A Tax Option. Select the tax to add to the form, and click the Rules double arrow icon to open the Rules dialog. In the Rules dialog, select the field and value to match and click Done. In this example, the Billing State must be equal to California for this tax rule to be applied. Add additional tax rates and configure the tax rules as needed. Q. The field I need to match to create a tax rule isn't in the dropdown! A. The fields must appear on the Order Form. Make sure the billing fields are present before configuring your tax rules. Q. Can you hide the taxes and just include the total amount for things like VAT? A. No, not using the tax rules shown here. Instead, adjust your product price to include the tax amount. Q. 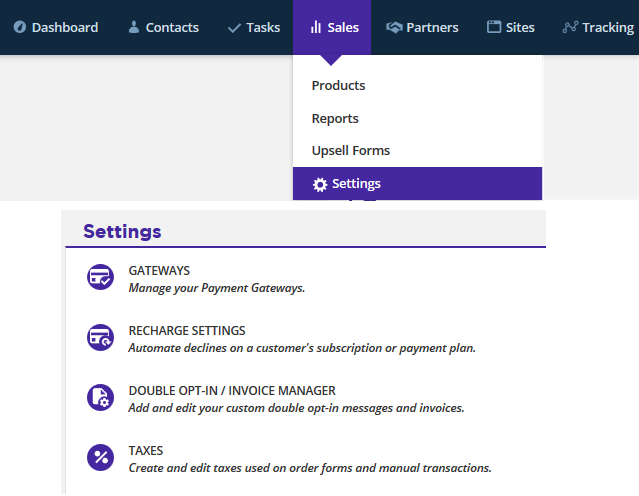 Are there other automated tax solutions that integrate with ONTRAPORT?